Description: Just leaving the autorack terminal the train is easing out of the yard westbound on track 1. 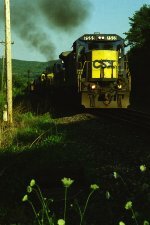 Description: CSX Q623 heads south. Description: We chased an eastbound detour train, probably Q 156, or possibly Q 404, I didnt note the symbol, to Susquehanna, then caught this Q 271 there going back. We were able to grab this shot along PA 171 where the tracks go away from the road at Red Rock. Thats my then girlfriend, now wife, Diane, getting a shot of the action too. Description: Q 271 behind a mis of CSX and NYSW power, rolls under the PA 171 bridge on its last leg into Binghamton. True to form, NYSW has filled out the auto rack train with general freight. Description: Q 271 gets blasts through SR, turning up the power as it takes to single track for the last lap into Binghamton. Description: Nothing like discovering a new location in your own backyard! Description: Old Glory, springtime and Q547 make for a good shot in Acworth. Description: Another eastbound passes the new signals (not yet in service) at mile post BG117.6. Description: Eastbound under Chestnut Street. Description: L173-13 rolls into St. Denis with 5311 and 7782 on the point.